Destiny’s value as a product cannot be measured in terms of quality. Let’s be honest with ourselves for a second here; regardless of your stances on Destiny, or on first person shooters more generally, the Rise of Iron DLC is a quality product if you focus on its level of polish. It’s been produced and developed by Bungie, the studio that defined console shooter standards when they released Halo. 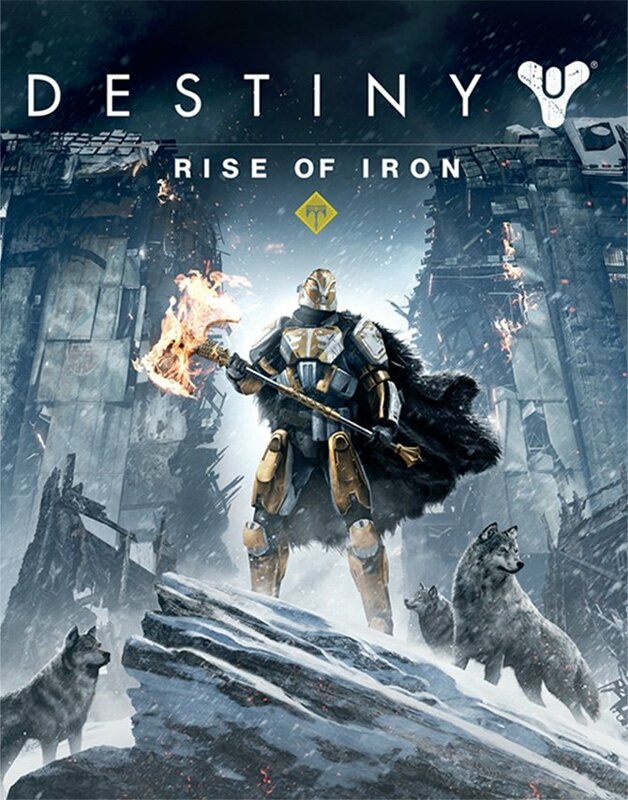 There is nothing about the game-play mechanics, visuals, acting, or controls that you need to worry about; however, that doesn’t mean I think you should go out and buy the Rise of Iron DLC. Anyone reading this review and hoping that this is the DLC that turns Destiny into the perfect shooter may want to ease off the edge of their seats. The list of problems it has is as long as my arm, but if forced to pick one issue I would say that the storyline of Rise of Iron is the biggest let down. 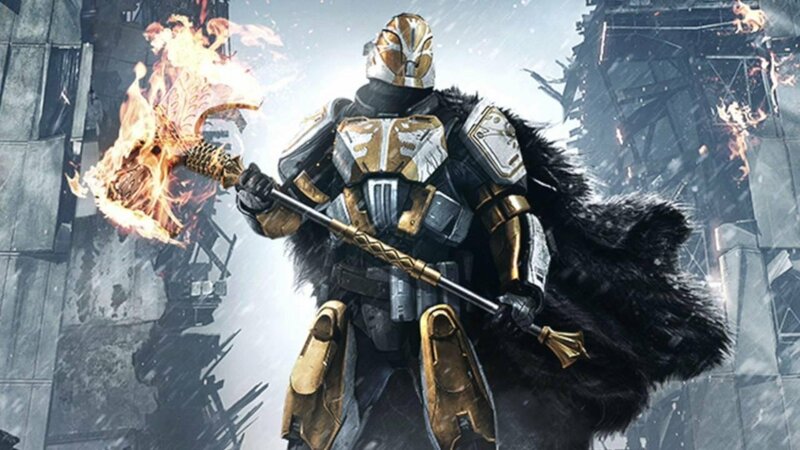 Without spoiling anything, the DLC starts with your being called to a random location and ordered by Lord Saladin (the NPC who shows up to run the Iron Banner every month) to defend the top of a mountain. By the end of that mission you have taken the first few steps in an exciting new story that will completely wrap up about two hours later. It’s not a terrible story, but I couldn’t help but think of the first time my character shared a cutscene with the Speaker (an NPC in the tower voiced by British actor Bill Nighy). You first meet him after the tutorial levels and at some point he literally says, “You must have no end of questions, Guardian.” It has been three years since I first heard Mr. Nighy utter those words and I am still waiting for Bungie to explain something. ANYTHING! Who or what is the giant white ball in the sky? Why is it so important that they made it a Easter egg in Halo 3 ODST? 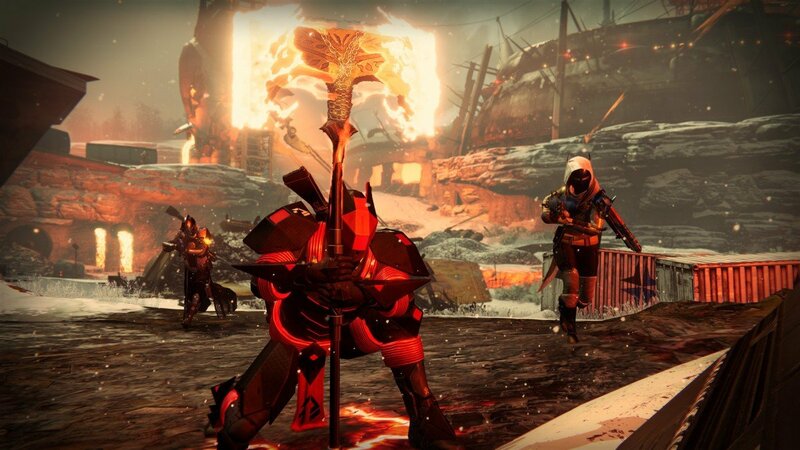 What’s with the various factions in the tower? Why did they think I would just fight for them the moment I showed up? Why are there three groups of guardians who basically play the same way? Why do we keep finding new forms of currency but not new forms of bad guys to fight? Did aliens really land in Nevada? Is Elvis really still alive? Why are the mint chocolate Girl Guide cookies always better after you stick them in the freezer for 10 minutes? Instead we once again find ourselves in a world where YouTubers and web comics are giving us more backstory than the game itself. Veterans of the franchise might take this chance to remind me of the Destiny lore you can read on digital trading cards by logging into www.Bungie.net. To those people I will simply say that I am paid to review games and not websites. If Bungie wants me to acknowledge those cards as part of the game then I have to be able to access them in the game. Now that I have gotten that off my chest, I should also point out that the mission design is a little repetitive. This issue can be sub-divided into missions that are not that inventive because the mechanics are played out, and missions that are not inventive because they’re simply recycled. One part of this game literally has you complete the first strike event (difficult three player co-op missions) in the game again. 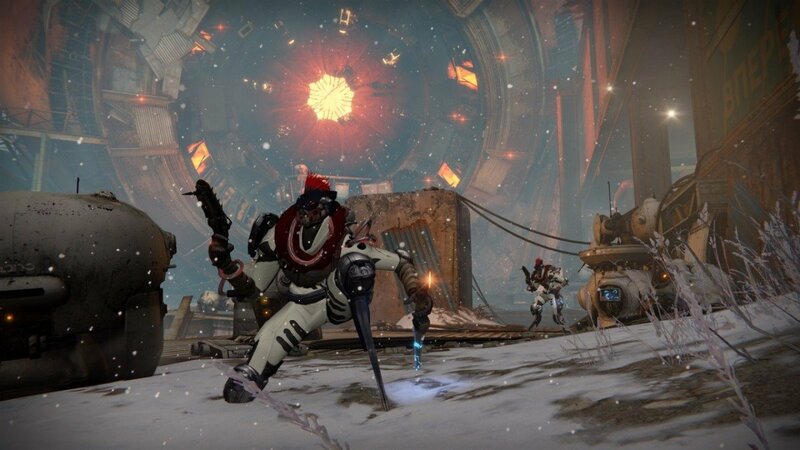 Destiny has yet to earn the right to recycle entire levels based on the premise that it is a fun romp down memory lane. That’s reserved for games with so much content that it would be impossible to have played that strike in the last year. The other part of this repetitiveness issue, the played out mechanics, might be what annoys the most people overall. Destiny has many problems, but few of them are as hated within the Destiny community as the first person platforming. 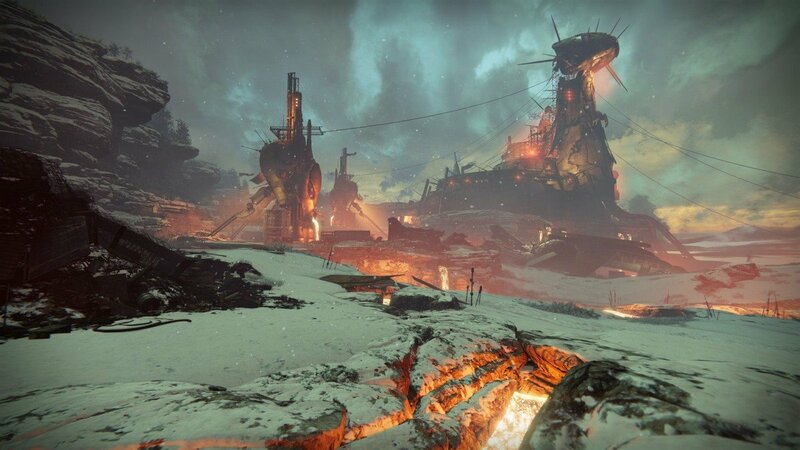 Without ruining the paper thin narrative, I will warn you that there are once again platforming puzzles in the Rise of Iron content. On top of that, do you remember all of the fun you had collecting the 50 calcified fragments on the dreadnaught? I honestly can’t remember why I did that, but with this new DLC comes a whole new set of random artifacts for you to collect. As with the Touch of Malice scout rifle, some of the new artifacts are attached to a weapon’s quest, and like the King’s Fall raid, some of these artifacts are hidden in the new raid. As with the Taken King, the new enemies are also just recycled from alien races you’ve already fought for years. The list goes on, but anyone who truly needs this buying advice will realize the extent of the problem by now. Character development is also handled poorly in the Rise of Iron. I remember being really excited about the character development in the previous Taken King DLC from last year. I was sad to see Peter Dinklage go, but the narrative of that story flushed out rest of the cast. It turned the paycheck Nathan Fillion collected for voicing a simple quest giver into a personality called Cayde-6. The same can be said for a number of the NPCs in the game, but Rise of Iron ignores the old cast in favour of a new set of talking heads. Sadly none of the new cast gets enough screen time to become anything memorable. In the multiplayer department, there also isn’t much to get excited about. Every map is well made, but comes off feeling like every other map in the game. The big new multiplayer mode this time is called Supremacy, which forces you to collect a dead player’s orb of light before you get the credit for taking them down. For those of you wondering, that’s the exact same rules as Kill Confirmed; a Call of Duty multiplayer game type where every downed player drops a set of dog tags that must be collected before points are awarded. The new MMO style patrol zone, known as the Plaguelands, is pretty interesting; however, I will stop short of calling it good looking because there is not much you can actually see. The Plaguelands seem to be eternally locked in a snow storm that has dropped the game’s draw distance down to drastically close. There is very little you can spot until you are right on top of it when traveling across the Plaguelands. To be fair, Rise of Iron is not all bad. For example, Bungie took a page from their Halo Reach development book and added the equivalent of armor abilities to Destiny, although they’re all more useful than armor lock ever was. This time around they didn’t lower the stats of your previous weapons and armor, so any purple items you were using can still be useful. While the majority of Destiny’s content comes off as recycled, the best parts of Rise of Iron provide some of the greatest gaming moments of this year. The game is perfectly balanced so that both new and veteran players will find challenges across this DLC; and as I said before, the visual, controls, voice acting, and game-play mechanics are as solid as possible in modern game development. In the end, Rise of Iron is literally just more Destiny. It doesn’t address any of the issues that you might have had with the original, and it doesn’t really flush out the existing world either. It is simply a new set of story missions, a strike, some quests, and another raid. As someone who had three different 335 level characters (the maximum level before the Rise of Iron was released) I would suggest that you keep your money this time. While this review clearly shows that I did not like the Rise of Iron much, I want to make it clear that I didn’t hate it either. The reason I would warn you away from this DLC is actually the price point. Destiny has always suffered from a lack of content, but even by Destiny standards there is not that much here for the $40 price tag. It really is that price point that I am having trouble with, and if the DLC cost $20 my recommendation would probably be different; however, as things are I would wait until a sale to play the Rise of Iron. Destiny still has the same problems it’s always suffered from.